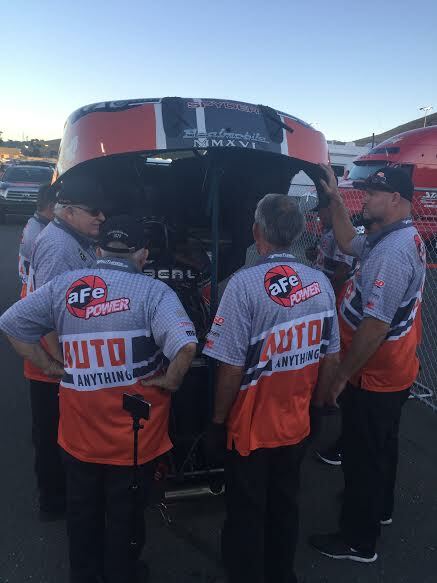 SONOMA, CA- The Sonoma Nationals did not go as planned for the Beal Racing AutoAnything team, as they failed to make the 16 car nitro funny car field. They were bumped down to the 17th qualifying position during the final qualifying session and were unable to move themselves back into the field. After sitting out the first qualifying run to save parts, the team posted a 8.818 in session two after driver Brandon Welch eased off the throttle due to tire spin. On Saturday morning, the AutoAnything Monte Carlo ran a 6.012 after spinning the tires yet again. The run positioned Brandon in the 15 slot going into the final round of qualifying. The fourth and final qualifying session proved to be a difficult one for Beal Racing. As the team waited in the staging lanes for their turn to make a pass, they were bumped out of the field as both the number 16 and 17 qualifiers ran mid-4 second passes. In its final qualifying attempt, the Beal Racing machine had several mechanical issues down track resulting in a 5.969 elapsed time. The car dropped a cylinder right at the hit of the throttle, experienced a malfunction in the fuel system, and sheared the bolts off of the bottom blower pulley. The perfect storm of problems caused Beal Racing to miss the qualifying field for eliminations on Sunday. The team is slated to run the NHRA Northwest Nationals in Seattle, Washington this coming weekend.